How far would you go to help someone in need? The Gospel reading for today is my favorite stewardship parable, that of the Good Samaritan. I love it because I feel it gives the most complete stewardship spirituality. To begin with, the Samaritan would not allow social divisions to keep him from answering the call of someone in need. Others who passed by had seen those constructs as too strong to allow them to break societal norms and bias. Some even chose to take advantage of someone in a compromised position. It was a mature person that understood what really mattered in the situation. In parallel to the life of a Christian Steward, we are called to answer the call of Jesus Christ regardless of the cost or the circumstances that make that response more difficult. 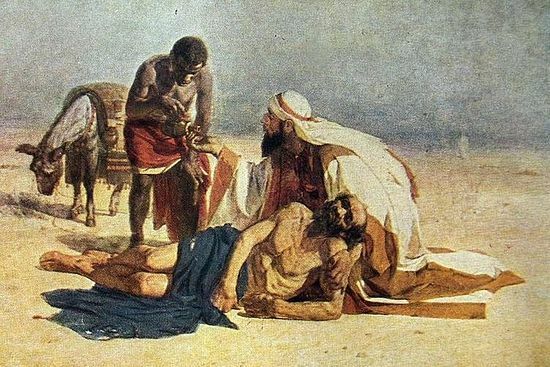 When the Samaritan met the man in need, certainly he had some knowledge of how to treat physical wounds. He knew to pour oil and wine on the wounds and how to bandage them. He then lifted the man unto his animal and took him to a nearby inn. The Samaritan gave of his talents, gifts, and used his possessions to help the man. Good stewardship requires us to use all we have been given to help others and respond to the call. Sometimes, we don’t even realize the gifts we have to use until the moment presents itself. Finally, after the Samaritan drops him off at the inn, he tells the innkeeper that we will be back on through the area and that he will pay for whatever the innkeeper has needed to tend to the needs of the man. The key here is not that the Samaritan was willing to use his treasure as well to help the man. It is that there was no ceiling on the amount of treasure he was willing to give for the man’s care. Often times we are willing to give of our treasure for a good cause or to someone in need, but we set a limit of how far that generosity will go. For the Samaritan, there was no such ceiling. He was willing to give freely and without measure. If we are honest, we can see that God gives to us lavishly. Our lives, our families, and our friends are just the tip of the iceberg in terms of what God gives to us. In turn, we should be generous in a lavish manner. When we are stumbling in our stewardship way of life, the parable of the Good Samaritan is a great passage to reread. We can reread it as many times as needed. Jesus sets forth in the tale the expectations of those who seek to follow Him and live lives as mature disciples and everyday stewards. Today, you may find someone placed in your path that needs your help. Think of this story before walking on by. ← Happy World Smile Day 2015!